PIPA poll results by media source. [Source: PIPA] (click image to enlarge)A poll conducted by the Program on International Policy (PIPA) at the University of Maryland reveals that a majority of Americans have misperceptions about the Iraq war, and these vary significantly depending on people’s primary source of news. 48% of Americans incorrectly believe that evidence of links between Iraq and al-Qaeda has been found. 22% incorrectly believe that weapons of mass destruction have been found in Iraq. 25% incorrectly believe that world public opinion favored the US going to war with Iraq. Overall, 60% have at least one of these misperceptions. For those who believe none of these misperceptions, only 23% support the war. But 86% of those who believe all three misperceptions support the war. 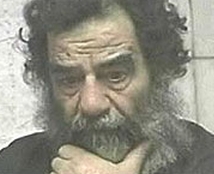 Entity Tags: Defense Contract Audit Agency, Halliburton, Inc.
Saddam Hussein shortly after his capture. 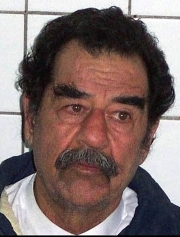 [Source: BBC]Saddam Hussein is captured by US forces, in an operation given the title of “Red Dawn.” Hussein is hiding in a tiny cellar at a farmhouse in Adwar, a village south of his hometown of Tikrit. Coalition Provisional Authority administrator L. Paul Bremer announces Hussein’s capture to a group of journalists by saying: “Ladies and gentlemen, we got him.… The tyrant is a prisoner.” According to soldiers present at the capture, Hussein put up no resistance. Iraqi Governing Council head Abdul Aziz al-Hakim says a DNA test proves the man in custody is indeed Saddam Hussein. Tip from Clan Member Leads to Capture - US military spokesman Major General Raymond Odierno says Hussein was captured within 24 hours of US forces receiving a tip as to Hussein’s whereabouts from a member of his clan. “He was caught like a rat,” says Odierno. 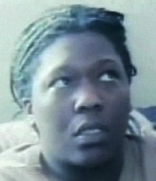 “It was ironic that he was in a hole in the ground across the river from the great palaces he built using all the money he robbed from the Iraqi people.” Of the tip, Odierno says: “Over the last 10 days we brought in about five to 10 members of these families, and finally got the ultimate information from one of these individuals.… This was not something that happened overnight. Since we have been [in Iraq] we have collected a lot of intelligence. We always knew that he was relying on family and tribal ties.” It is not known whether that clan member will receive the $25 million offered by the US for information leading to Hussein’s capture. Odierno describes Hussein as “very much bewildered,” and notes that when Hussein was captured, he said “hardly anything at first.” He is described by US officials as polite and cooperative in his captivity. 'Spider Hole' - Hussein’s hiding place, characterized by some US spokesmen as a “spider hole,” was a small hut with two rooms: a bedroom cluttered with clothes, and a kitchen with running water. 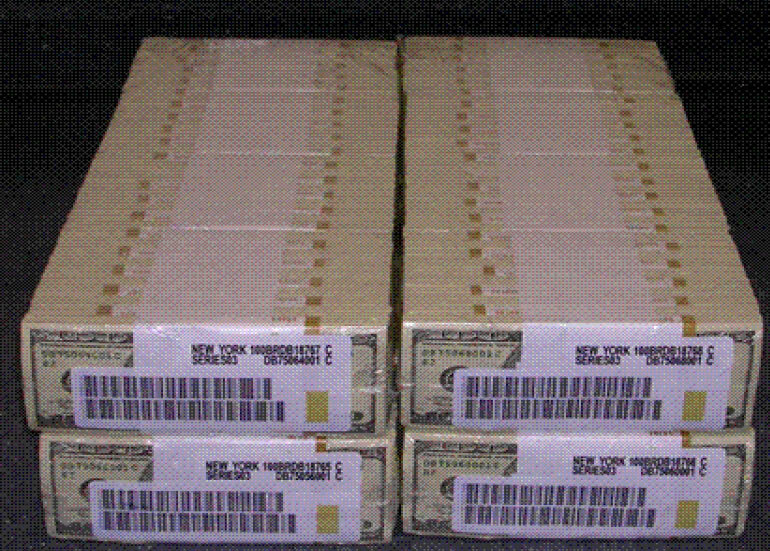 [BBC, 12/14/2003; Fox News, 12/14/2003] The hut contains some $750,000 in US money. [Christian Science Monitor, 12/15/2003] The cellar where Hussein is found is a tiny, rough-dug hiding place, with a styrofoam cover and a tube to allow air in. One US lawmaker, Congressman Jim McDermott (D-WA), believes that the story surrounding the capture of Saddam Hussein (see December 14, 2003 and December 17, 2003) is false. 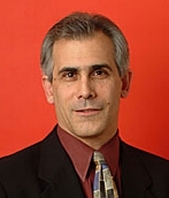 Instead, McDermott alleges, the capture was stage-managed for President Bush’s political benefit. “There’s too much by happenstance for it [Hussein’s capture] to be just a coincidental thing,” he tells a Seattle radio interviewer. When asked if he believed the timing was planned to help Bush, McDermott replies: “Yeah. 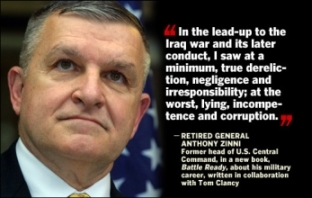 Oh, yeah.” McDermott notes that the US had “been in contact with people all along who knew basically where he was.” He adds that the timing of a recent move by the Iraqi Governing Council to hastily enact legislation for a war crimes court to try former regime members is suspicious. Bush supporters will accuse McDermott of spreading “paranoid conspiracy theories” and “crazy talk.” [Asia Times, 4/17/2004] Subsequent evidence will bear out some of McDermott’s skepticism (see January 2004). One of the slides in President Bush’s presentation during the evening’s entertainment. 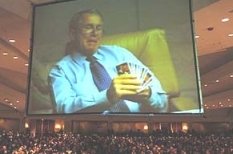 [Source: Nicholas Roberts / Getty Images]President Bush, the guest of honor at the annual Radio and Television News Correspondents Association black-tie dinner, shows a slide show for his portion of the evening’s entertainment. 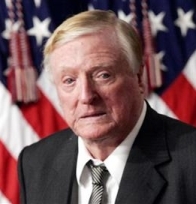 As is the tradition of the dinner, powerful lawmakers and media figures poke fun at themselves and the issues of the day, usually with little political fallout. But many are offended by Bush’s humor in the slide show. One picture shows Bush looking under a piece of furniture in the Oval Office, with his accompanying remark, “Those weapons of mass destruction have got to be here somewhere.” A second slide shows him looking in the corner of a room, and the voiceover says, “No, no weapons over there.” A third picture has him leaning over and saying, “Maybe under here?” While most participants at the dinner laugh appreciatively, many others are offended, seeing Bush as making light of the rationale for a war that has led to the death of almost 600 American soldiers by this time. 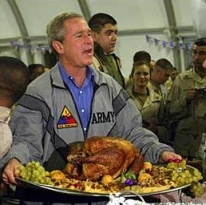 [BBC, 3/26/2004; Associated Press, 3/26/2004] Bush’s humor draws an onslaught of criticism from Democrats, soldiers, and the families of US soldiers slain in Iraq (see March 25, 2004 and March 25, 2004). The burned, mutilated corpses of two Blackwater contractors hang from a bridge outside Fallujah while Iraqi civilians celebrate. [Source: NoGW.com]Four employees of the private security firm Blackwater, Jerry Zovko, Wesley Batalona, Scott Helvenston and Michael Teague, are killed by small arms fire while driving through Fallujah. [The News Observer, 7/8/2007] Their bodies are then taken out of their convoy and mutilated by an angry mob. Images of two corpses of the contractors hanging from a bridge over the Euphrates River are sent all over the world. 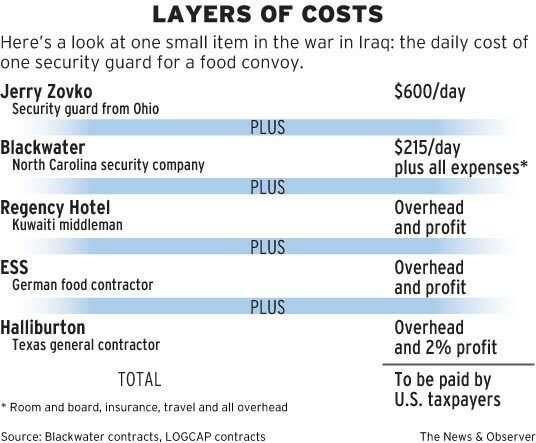 The families of the four slain men later file a lawsuit against Blackwater claiming that the company broke their contract by cutting corners on security costs in order to make a greater profit. 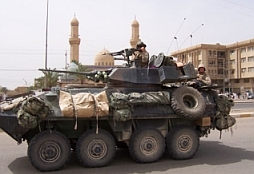 The convoy that the Blackwater employees were driving lacked both armor for protection and a rear gunner, making it extremely easy for a few Iraqi gunmen to kill them. There also was an alternate path around Fallujah the men could have taken but did not know about because Blackwater did not conduct a “risk assessment,” which they were contractually obligated to do. 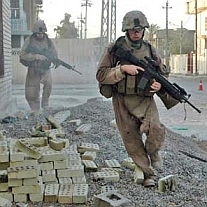 [Nation, 5/8/2006] In July 2007, memos from another Blackwater team published in the media blame Blackwater’s Baghdad manager, Tom Powell, for sending the two teams into Fallujah undermanned, underarmed, and without maps (see June 8, 2007). Simplistic Explanations Inaccurate - However, Iraqi experts on the region say the truth is far more complex. The area is inhabited by a deeply clannish network of tribes and groups, as is much of the so-called “Sunni Triangle.” To many of these inhabitants, personal honor and vengeance is more important than any possible return of the Hussein regime. The problem began in the days after the initial occupation of the area by the Army’s 82nd Airborne Division, where, according to some experts knowledgeable about the situation, the residents felt dishonored and disrespected by their occupiers. “You can never forget that in this area retaliation is almost the fundamental element of the tribal system, its focal point,” says Sadoun al-Dulame, a Baghdad-based political scientist who grew up in the area as a member of the Dulame tribe. 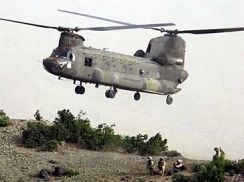 “This is a revenge culture where insults to people’s honor will always be repaid with violence.” The recent upsurge in violence in the area may also have something to do with the 82nd turning control of the region over to the Marines; area insurgents may be testing the new troops. Experts such as al-Dulame say that if Fallujah residents feel that their interests will be protected by a new government (likely to be dominated by the Sunnis’ ancient rivals, the Shi’a), then violence will lessen. But even the most optimistic estimates say that peace in the region is a year or more away.